In September, the grade 9 students packed their bags and headed on an excursion to YMCA Camp Pinecrest. Accompanied a group of senior students, the class spent four days engaging in numerous team-building activities, including canoeing, archery, and many more traditions of the TOPS program. The TOPS Program, located at Marc Garneau C.I. (Toronto, ON), is a special high school program for students interested in enrichment in the maths, sciences, and language arts. TOPS offers a strong leadership program and encourages students to reach their utmost ability. In the Grade 12 Data Management class, students finished up their unit on combinations and have now moved on to probability. Through the use of cards, coins, and dice, they have been modelling different situations and calculating the experimental and theoretical probabilities. This useful skill has many real life applications, and will come in handy for any future experiments. 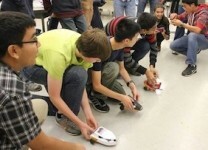 This week, the technological design class culminated their Electronics unit with a Bumper-Bot race! Students meticulously soldered dozens of electronic components, and attaching motors and wheels to their own creatively inspired base. The bots ranged from chickens to tanks, and did not fail to entertain. In Computer Science class, Grade 10s are blasting off into a new unit as they take on the challenge of simulating a rocket ship’s flight in space. Students are learning to import images and sounds, and use loops to make their creations come to life. The grade nines have moved on to explore the science within the human body! Today they stepped into the life of a healthcare professional as they used stethoscopes and sphygmomanometers to probe and measure each other’s heart rate, and blood pressure. 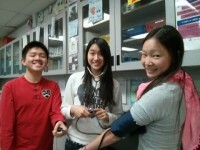 Such an experience allows students to better understand the complexity of the circulatory system. 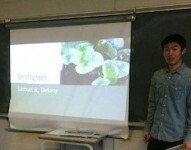 This week Grade 12 students gave presentations on short stories to discuss aspects such as style, conflict, and purpose. Authors ranged from H. G. Wells to Alice Munro. Students will complete the unit by writing an introduction to an anthology filled with stories of their choosing. This week grade 10 students began the first of a three-part lecture on the evolution of the English language. With the Gregorian Chant playing in the background, the young scholars learned about the history of England–from the Roman Empire to the Vikings and their contributions to Modern English.